I've been wanting to link-up to lovely Max's Op-Shop Show-Off since she started hosting it. The only thing that's stopped me, is my failure to find anything worthy enough to show-off. b) I've become an old fussy-pants about what I bring home. Finally though, I reckon I've found something that makes the cut. and yet I can't stand it on walls! because this! is what we inherited when we bought our house. If you don't (and even if you do) pop over to A Blackbird Has Spoken, I'm sure you'll find something there that tickles your fancy. Is that the colour from the prev post? Namadji? If it isit sure does go on much richer and darker. But I like it. Very dramatic. I'm not very brave when it comes to wall colours I'm afraid. Might be worth bringing you over for a deco consult though I think! Gotta say I struggle with yellow. I think it was all that yellow and blue everyone painted their kitchens in the late eighties. But yellow and grey are lovely together, as you've demonstrated. Your Italian vase is sooo beautiful!!! Love the shape and the colors!! The room it's in is so great too, love the black walls, the cowhide and the piece of furniture it's standing on! Love the vase but agree with you about yellow walls. Your vase is a knock-out! I love that yellow chest too. I love that first picture with the table, jug, walls, rug and picture. It's such a beautiful still life. You are a natural at styling. The jug is great, such a lovely shape. Yellow: I love daffodils in spring, they are like sunshine and actually I can wear yellow, it improves my complexion. But I'm like you, not so keen on it on the walls because I have done it previously. It was a custard yellow, bad idea. the way you put it, yellow is definitely it. Love your vase and the colour but agree about the walls...they are rather violent. I love yellow, and I frigging LOVE that vase/jug!!! Gawd, I'm useless at linking to anything, as I always forget, or get the day wrong, or some such stupidity!!! I do like your yellow vase, but those yellow walls are bloody hideous! Migraine inducing. I really really like the dark grey walls, as I think I mentioned. They set things off so nicely. Don't know that Ben would go for it though. 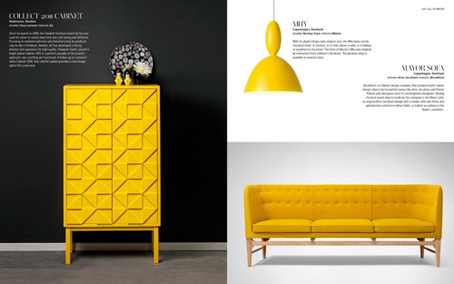 Yes yellow accessories and furniture are lovely. not so much whole walls. Yes - II've been wanting to link up with the op shop finds too but I don't get out much and, like you, I'm fussy these days! I have op shop rules now. And I LOVE yellow- I love yellow shoes and yellow objects - but yellow walls make you insane. So. I think we have an agreement there on everything. Hurray for making it over to Max's, for yellow, and for nice jugs! I know, I'm so cheeky. 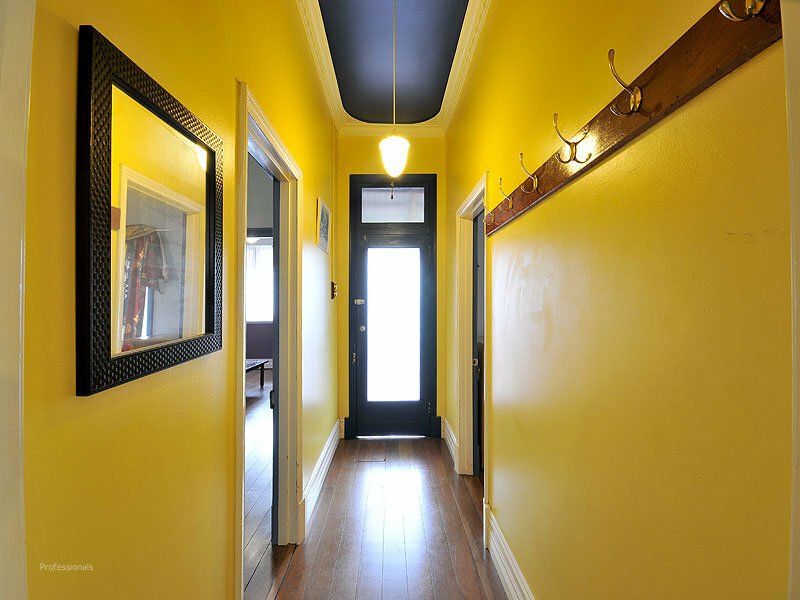 I do love yellow, but all those walls are a little too much of a good thing. Accents, darling, it's all about accents! I love the vase Kylie and your dark wall is beautiful. Wow...look at that yellow hall. When we were first married I painted our lounge room in a Dulux colur called Banana Daiquiri which was just as the name describes. Our first home and I felt SO bold and grown up. A few years later I grew to hate it. It has long gone but it took a lot of covering up. Aussie pottery? 'strong robust aussies' I'd say. love your Italian pot, just lovely. Yellow walls? well I had a yellow and blue laundry I quite liked when I did it in 1992 or thereabouts, but glad it is gone now! Yellow and blue were quite the ''in'' colours for a while you know. Oh the jug is a beauty and yes its perfect with the yellow. I have of late been on a yellow crazy op-shop finding spree. Yellow wallets seem to be the favour of the day. Yay for the link to Max. Exactly the same description of this tea towel I have just come across. Do you already have it? If not, I spy a Christmas present coming your way from moi!!! The photo does make the walls look pretty good,esp.with the mirror and the lovely coat rack. Your yellow hall beats our former yellow hall though, ours was more pastel.Love your vase, there's something lovely about rustic ceramics. ....thinking of painting a yellow wall myself, seriously a mustard one, I already have a citrus dining room! Love the Namadji wall, absolutely one of personal faves in dark paint colours. Can I ask which artist painted the print on the Namadji wall? Really enjoying catching up on your posts, always brings a smile !